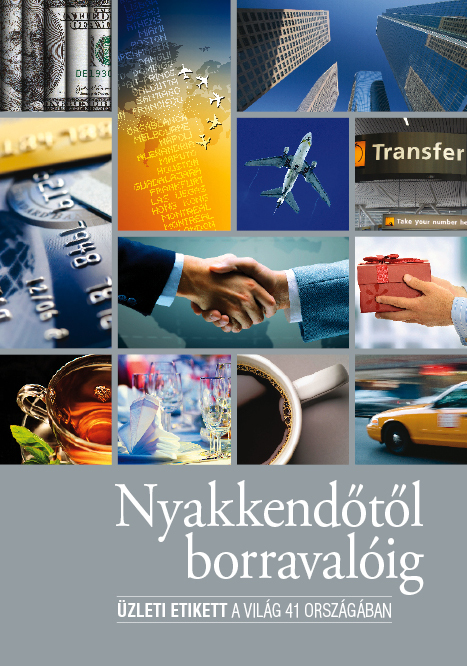 The publication presents the typical negotiating and contracting customs and dress codes in 41 counties, and provides useful information on subjects as diverse as changing money, transport, dining habits and holidays. There are places where nodding one’s head means “no”, and others where giving a watch as a gift is the worst possible thing, but it can also be that the right thing to do is not blow one’s nose but sniff, and in certain parts of the world it is customary to enter a restaurant with bare feet, while being late is interpreted differently in different countries. And whereas in the East ‘creative business solutions’ can generate recognition, in the West we might have to count on considerable antipathy towards the idea. The book Nyakkendőtől borravalóig (From Tie to Tip) helps guide us through these pitfalls. It was published by Turizmus Kft. in late 2012. This exclusive publication provides a comprehensive picture of those people who have had the greatest influence on Hungary’s tourism in 2016. Tourism is one of the driving forces of Hungary, at least as far as the prevailing government interpretation is concerned. However, the situation is not as simple as this. As complex as the sector is, so it is also at least as fragile, and at least as dependent on politicians, managers of Hungarian or international enterprises, diplomats, indeed, everyday figures in the domestic service provider sector. So far we have published three editions of ‘The 50 Most Influential People in Hungarian Tourism’; each edition has been extremely positively received both within the profession and among the general public. We asked top experts from tourism’s professional bodies to form a jury in order to select the 50 people worthy of being included and then – on the basis of a comparison of several fixed parameters – award each person points. This is how the final ranking is established. This publication will be of interest to anyone wanting to know who contributes to the nearly HUF 1500 billion generated in revenue from the tourism of Hungary. Every year the publication is presented to the public at the industry’s most significant event, the Tourism Season-opening Gala and Awards Presentation Reception, to which, naturally, members of the TOP50 are also invited. Please contact us for advertising space in the next publication. Working in cooperation with Budapest Festival and Tourism Centre Nonprofit Ltd., Turizmus Kft. publishes Budapest’s official, free maps printed in the highest number of copies. The English language map is the essential travel companion of foreign tourists interested in Budapest and staying in the capital. It is packed with useful information (sights, public transport etc. ), and places where the Budapest Card is welcomed. Tourists can find it in Budapest hotels and tourist information offices as well as on its own stand at the luggage reclaim area in the arrivals terminal of Liszt Ferenc International Airport. Please contact us for further information and customized offers. Turizmus Kft. has published – on the basis of a British licence, and with special attention to the specific domestic features – the quarterly Business Traveller Hungary, Hungary’s only magazine for corporate travellers and travel organizers, since 2003. The magazine is distributed not only to subscribers but can be found in the Business Lounges of Liszt Ferenc International Airport, at Manager Forum events, and it is also despatched to prime corporate partners of Sixt and Hertz car rental firms and Vodafone. Each edition of turizmus.com magazine published 10 times a year is read by approximately 15–20,000 decision-making experts, local government and state administration managers. Articles and background information published in turizmus.com magazine examine the burning issues affecting the tourism profession. The magazine is the official journal of the Hungarian Hotel & Restaurant Association, Association of Hungarian Travel Agents and Tour Operators, and the Hungarian Baths Association, as well as strategic partner of the Hungarian TDM Association.